Ingredients: Crumbs, Made With Meals: Wheat, Corn, Oat, Rice, Soybean, Barley, Buckwheat, Bean, Pea, Water, Whole Eggs, Shredded Coconut, Precooked: Fresh Meat, Fresh Poultry Meat, Fresh Fish; Fresh and Dehydrated: Meals of: Shelled Peanuts, Brazil Nuts, Cashews, Filberts, Pecans, Walnuts, Almonds, Shelled Pumpkin Seed; Water, Grounded Coconut, Whole Eggs, Bone Meal, Precooked: Fresh Beef Meat, Fresh Poultry Meat, Fresh Fish, Fresh and Dehydrated: Carrots, Dandelion, Chicory, Kale, Grapes, Bananas, Apples, Oranges, Pears, Apricots, Milk; Honey, Corn Syrup Solid, Casein, Salt, Brewers Yeast, Yellow Beta Carotene, Cod Liver Oil, Wheat Germ Oil, Dextrose Carrots, Dandelions, Chicory, Kale, Grapes, Bananas, Apples, Oranges, Pears, Apricots; Sunflower Meal, Shelled Peanut Meal, Non-Viable Hemp Seed, NON STERILIZED THISLE SEED (NIGER) Kelp Meal, Bone Meal, Milk, Honey, Corn Syrup Solid, Salt, Brewers Yeast, Dextrose, Casein, Vitamin A Supplement, Vitamin D3 Supplement, Vitamin B12 Supplement, Riboflavin Supplement, Niacin Supplement, Calcium Pantothenate, Choline Bitartrate, Folic Acid, Menadione Sodium Bisulfite Complex, Pyriodoxine Hydrochloride, Thiamin Hydrochloride, d-Biotin, Ascorbic Acid, Manganese Sulfate, Magnesium Sulfate, Potassium Iodide, Vitamin E Supplement, Calcium Carbonate, Calcium Propionate Added To Preserve Freshness, Artificial and Natural Color and Flavor. Feeding Instructions: Combine 4 tablespoons of ABBA 92A and 2 tablespoons of cold water. Mix thoroughly to activate the ingredients. Then add a cooked, grated egg (Simmer the egg for 5 minutes, let cool in the same water, then grate shell and all) and mix thoroughly. Keep the above mixture fresh before the feeding parents at all times. Excellent breeding success has been achieved by many fanciers by using ABBA 92A without the cooked egg. Moisten 4 tablespoons of ABBA 92A with cold water and add 3 tablespoons of SOAK SEED. Mix thoroughly. (Moisten only what you will use in one feeding). Keep the mixture fresh before the feeding parents at all times. Your birds will adjust without cooked eggs. You can achieve better breeding results with less work. 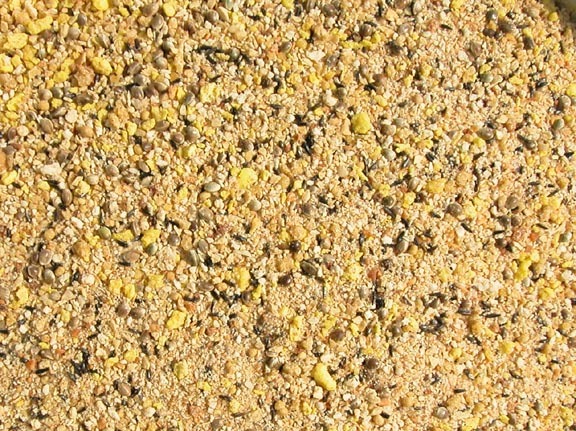 As a supplement: A small amount of dry ABBA 92A may be supplied daily to all seed eating bird year round. In addition, feed a well balanced seed diet and offer daily in small amount a variety of fresh greens and fresh fruits. Also as a supplement feed SOAK SEED. ABBA SOAK for smaller birds and ABBA 5000 for medium to large hookbills. BE CAREFUL! All moist food sours quickly, especially during the warm months of summer. Do not allow the birds to eat sour, moldy food. Prepare only what you will use in one feeding. Discard any unused portion. Follow the instructions and you will be successful in raising and breeding strong and vigorous cage birds.